A tart has a straight side and a solid filling, so that it can stand on its own on the serving plate, and not run onto the service plate. Photo courtesy Pichet Ong. 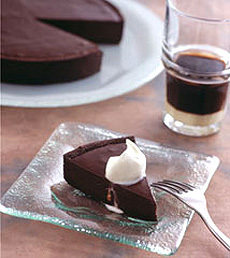 See his recipe for this Vietnamese Chocolate Tart. Most of us love pies and tarts. Yet the terms aren’t interchangeable, even if the products are equally delicious for dessert (or a savory pie for dinner). Here, the differences are set forth. You may also be interested in the difference between cake and torte. Crust & Filling. 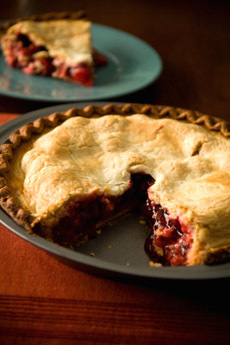 Both tarts and pies comprise a pastry crust with a filling that can be sweet or savory. Multiple Or Individual Servings. Both pies and tarts are multiple serving dishes. While individual-size pies are called mini pies, an individual tart is a tartlet. Number Of Crusts. A pie can have a full top crust, a lattice, or be open-faced. A tart has only a bottom crust. Flans and quiches are also tarts; and a cheesecake is a cheese-custard tart. Type Of Crust. While both pie and tart crusts use the same ingredients (flour, shortening, cold water, salt and sometimes sugar), they are in different proportions for different purposes. Pie crusts are thin, soft, flaky pastry that can be made with different types of shortening. Typically, vegetable shortening or lard is used. The pie is served from the pie pan. Tart crusts are traditionally made with butter to achieve a buttery pastry flavor. The tart crust is firm such that the tart can stand independently when removed from the tart pan. A tart is meant to be unmolded before serving. While it can be served from the pan, the idea is to enjoy the beauty of the standing tart without the pan. This is especially true with a beautiful fluted crust. A pie has a thin crust and a soft filling. Photo by Eric Hood | IST. Type Of Pan. The sides of a pie dish or pan are sloped and the dish can be made from a variety of material, such as ceramic, glass or metal. A tart pan has straight or straight fluted side with a removable bottom. A pastry ring atop a baking sheet can also be used. Size. A standard pie pan is 9 inches in diameter and 1-1/4 inches deep. Other common sizes are 9-1/2 inches and 10 inches. Tart pans range from 10 to 12 inches in diameter, with a depth from 3/4 inches to 2 inches. There are also rectangular tart pans, typically ranging from 11 inches to 15 inches in length, that make a handsome presentation. 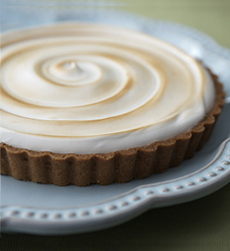 A lemon meringue tart made in a fluted tart pan. Photo by Frankie Frankeny | Miette Bakery. Take a look at the Miette Bakery Cookbook. Consistency Of Filling. Pie fillings can be loose (fruit pie) or firm (custard pie and pecan pie, for example). Tarts have firm fillings, based on more eggs or other binders. This is especially important since the tart is free-standing—no pie plate for juices to run onto. Now that you know the difference, take a look at our beautiful Pie & Pastry Glossary. Find pie and tart recipes. 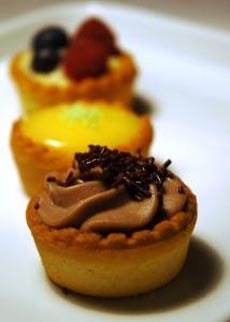 A miniature tart is called a tartlet. Photo courtesy SXC.